Complex Projects targets all scales of the architectural thinking: details, building, city, and region. Complex Projects aims to expand the knowledge about design and dense urban area development, and to broaden the mind and thinking of future architects. The architect operates within many different scales and cultural contexts. Consequently, the architect sees the world through many lenses: as an artist, organiser, politician, economist, philosopher, strategist, humanitarian, planner and sometimes visionary. The complexity of these parameters converges into a new definition of design. This enables students to unpack virtually any set of design constraints, cultivating a strong critical and analytical approach to the design process. In Complex Projects, the research-by-design zooms in from the large scale of the city itself, to the medium scale of the site, to the scale of the building. This serves as basis for a design narrative that in turn is a lead for individual proposals. The research products of the different design studios vary from the kick-off material provided by the teachers to the individual design projects, models, collages, books, videos, wallpapers by the students. Through the various products it becomes visible how the research led to the narrative, and how this in turn is translated in design. A selection of the students' works is part of the exhibitions periodically organised and curated by the Chair. The MSc 1 design studio focuses on buildings in the Netherlands and makes students familiar with the multiple aspects of research and design. Students conduct an architectural design project in a Dutch city, which challenges to explore both the tradition of Dutch planning and building culture. It is about identifying and making decisions on the balance between ‘what changes’ and ‘what remains’ in Dutch architecture. The MSc 2 design and research studio focuses on European cities and their landmarks. We expose the basic layers which define the city and its buildings. Both the tangible and intangible are separated and examined individually to understand each layer’s character or essence. 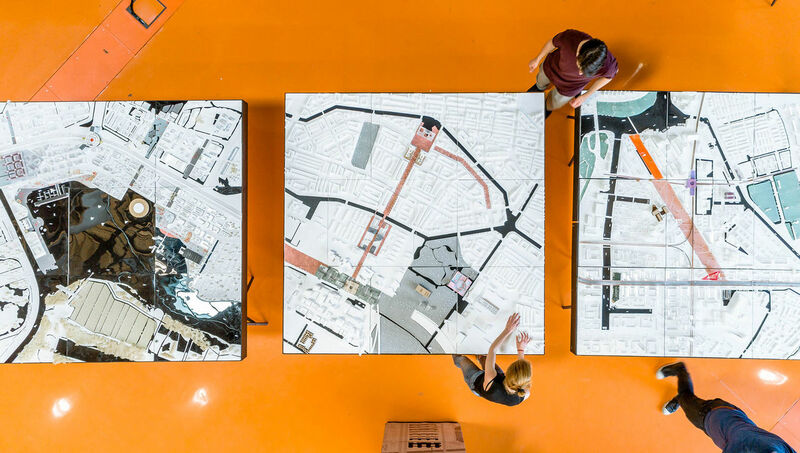 Students design a medium size project in a European city. * Please note: In the fall semester 2019, Complex Projects will offer the MSc2 design and research studio AR2CP010 Datapolis of 12 ects (start week 1.6). A new MSc2 studio AR2CP011 will be offered in the spring semester 2020 (start week 4.1). In the MSc 3/4 Graduation studio, all elements of the building and design will be seamlessly integrated into a clear compelling project. The project deals with all issues such as analysis, problem definition, urban design, building in context, building concept, to critical detail. These are all based on a clear narrative that contributes to increase the relevance and criticality of the project. The studio has a global orientation and defined method. The Msc3 research phase focuses on testing and defining the brief of urban and architectural design interventions, that steer the transformation of existing locations around the world.